NOTE: Here is a pair of runs that begin in the same spot and follow the same route for the first 1.7 km. 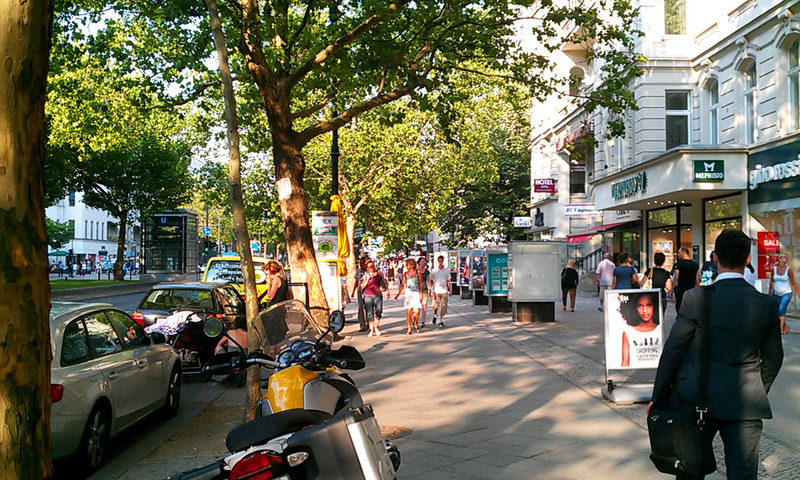 The Kurfürstendamm Out-and-Back is a simple 7.4-km run down western Berlin's main shopping and entertainment strip. 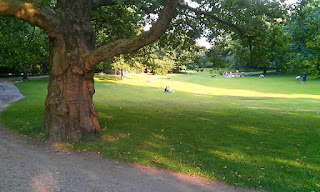 The 8.1-km Wilmersdorf Loop turns off after 1.7 km and circles through the residential neighborhoods south of the Ku'damm, then heading through the scenic Volkspark before turning north again to the start. Choose the route that suits you best! If you're staying in Berlin Wilmersdorf, or if you just want to experience the old West Berlin of cold-war days, this is the main route to take. 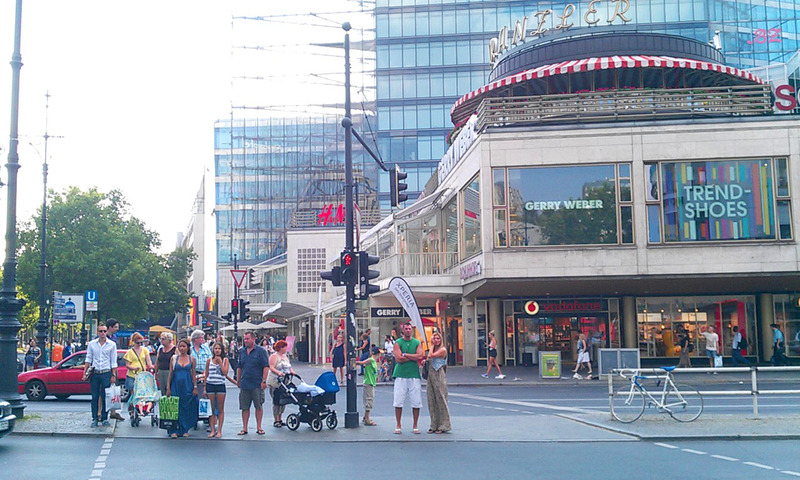 It heads up and down the Kurfürstendamm (Ku'damm), the cultural and commercial center of the west side of the city. 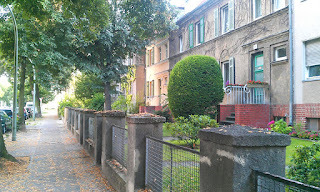 I first experienced this neighborhood back in 1984, when I was in town for the Berlin Marathon. Back then, it was the hub of everything interesting in West Berlin. The city was surrounded by a wall, with no place to escape to, unless you drove all the way through East Germany to West Germany. So West Berliners were stuck in their open-air prison, and the Kurfürstendamm was the stage upon which they played out their social life. All the shopping, cinemas, cafés, good restaurants, music clubs and bars lined this buzzing street, while locals paraded their cars up and down the street like in small-town America. Crowds filled the sidewalks till the morning hours, while the discotheque on the top floor of the Europa Center flashed its colored lights over the Berlin Wall, far across to the east side of the city, as a beacon of freedom, wealth and quite a bit of arrogant showing off. After reunification, the old Berlin city center (Mitte) -- which lay in the east -- began regaining its old importance, and the crowds moved eastwards. 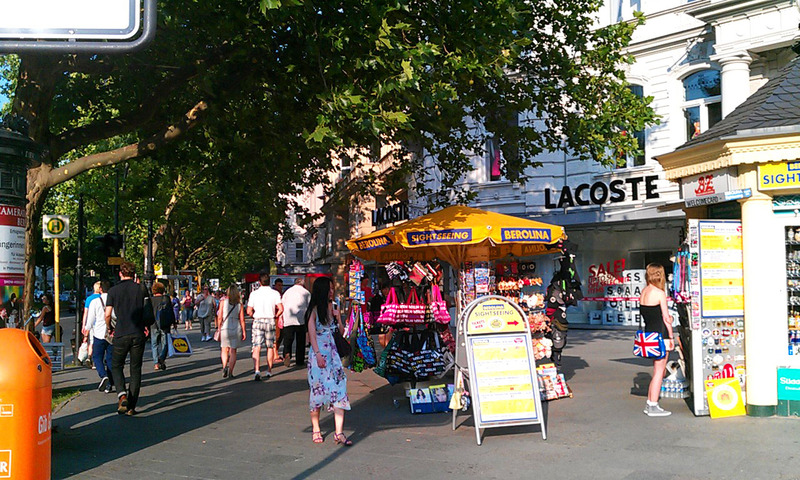 The Kurfürstendamm suddenly lost its monopoly on Berlin street life. 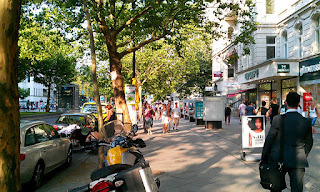 I hadn't been back in Wilmersdorf in years, so I was interested in seeing what it was like nowadays: a gloomy shell of its previous self or if it was able to hold its own as a place to shop and have fun? I was pleased to see that its old character had remained. Most of the cinemas are now stores, and some exclusive car dealers have moved away, but otherwise business is hopping. 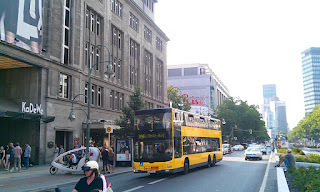 This route starts a bit east of the Ku'damm, at Wittenberger Platz, site of KDW (Kaufhaus des Westens), Germany's biggest department store, famous for its gigantic delicatessen. It then winds by the Europa Center and then follows Kurfürstendamm down to its end, before heading back up the other side. The route is easy to describe and to run: just follow it out and back. Wittenbergplatz is served by U-Bahn lines 1, 2 and 3, plus a variety of buses. 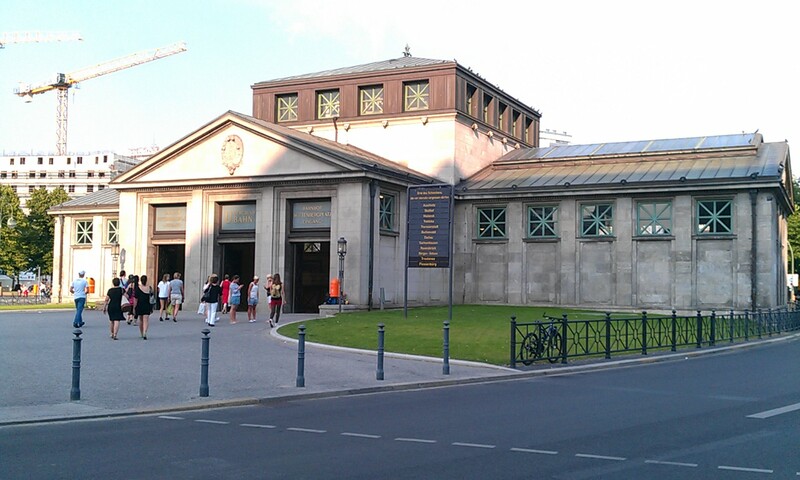 The old U-Bahn station is worth looking into: the walls are covered with original advertizements from the early 1900s. 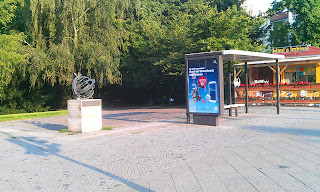 KDW sits at the southwest corner of the platz. Turn westwards, facing the Europa Center, with its revolving Mercedes star on the roof, and take off westwards, down Tauenzien Straße. 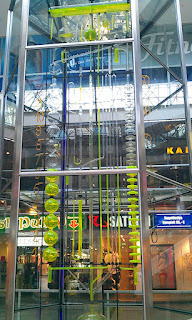 If you run through the Europa Center (or visit it later), you'll get to see its amazing water clock. 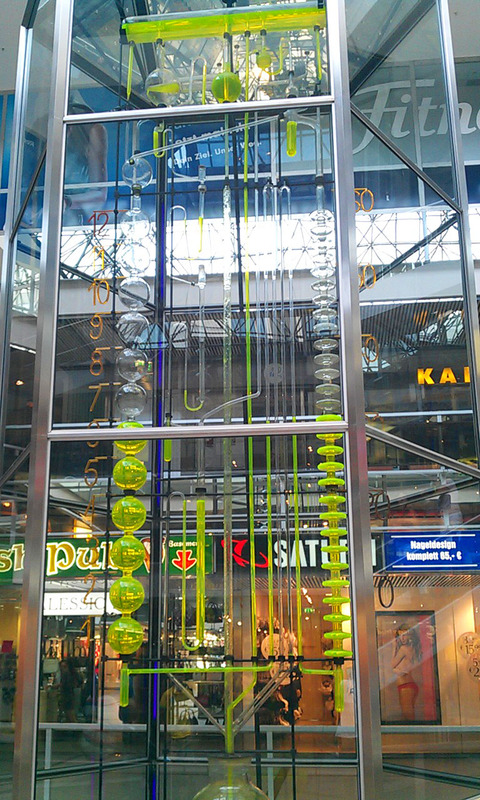 Yellow water flows through various glass pipes and containers to perfectly count out the time in this multi-storey wonder. Tauenzien then curves to the left to join the Kurfürstendamm at Breitscheidplatz, with its strange fountain and the ruins of the Kaiser Wilhelm Gedächtniskirche (memorial church). The ruins were left there after the war as a symbol of the catastrophe brought on by war. NOTE: during this visit, the ruins were hidden behind scaffolding while they were being refurbished. So, this is it, the Ku'damm. There are mobs of people to run around, but if you like streetlife, this is the place to be. There are old-fashioned shop showcases out on the sidewalks and old-fashioned news-kiosks and a line of trees down the middle, giving it a good dose of old-world charm. After you pass Adenauerplatz, the designer shops become less frequent, and everything is more residential. When you reach Henriettenplatz, the Ku'damm ends at the S-Bahn tracks, so turn around here and run back on the other side of the street. As the note at the top says, if you want a longer, more varied route, with fewer crowds, take this one. Just turn south (left) off of the Ku'damm after 1.7 km, at Bleibtreu Strasse, to head through the rest of Wilmersdorf. This street will give you a feeling for the quieter side of this pleasant borough, with its elegant old apartment houses and hotels. 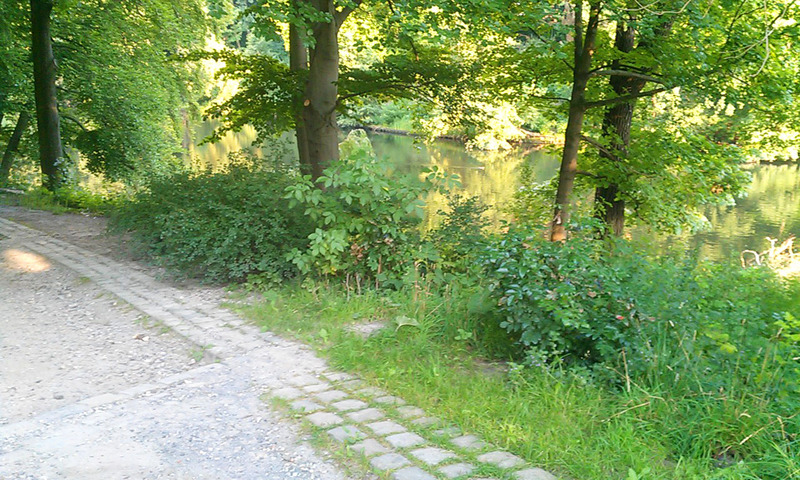 You now head straight south to the Volkspark for two more km. After just one block Bleibtreu changes its name to Sächsische Straße, but just keep going south. When you cross Brandenburgische Straße, keep going south on Mannheimer Straße, with a few businesses on the left side, and row-houses on the right. Mannheimer Straße ends at Volkspark Wilmersdorf, with Fennsee lake right in front of you. Turn left to run eastwards along the small lake. At the end of the lake, you'll come to a big intersection. You have to cross to the other (south) side of the street to continue in the park, over there at Mimi's Imbiss. From now on, just follow the park all the way to the east end, two km further on. 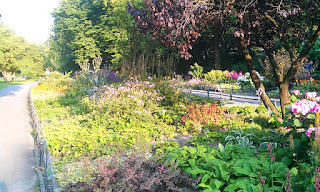 The park is a pleasant hangout, with athletic fields, flower gardens, lawns for picnicking, and some scenic ponds. There is a pedestrian suspension bridge to take you up and over Bundesallee, which is much safer (and legal) than trying to cross it on the ground. 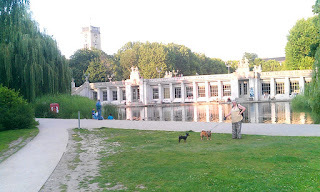 At the pond with the Schöneberger Rathaus U-Bahn station, run past the station to the last part of the park. When you get to the statue of the golden stag, you've made it to the end. Now turn to the left (north) and run through the PlatzHirsch biergarten (I stopped in here during my latest run there, as it was one of the hottest days of the year!) and past the front of that big building with the clock-tower. 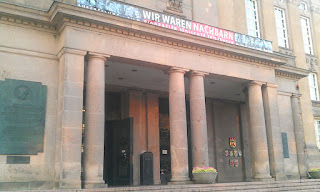 That's the Schöneberger Rathaus (Schöneberg borough town hall), where President John Kennedy gave his famous "Ich bin ein Berliner" speech. 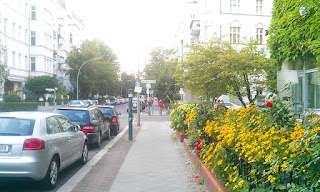 You are now on Martin Luther Straße, which you could follow all the way north back to Wittenbergplatz. 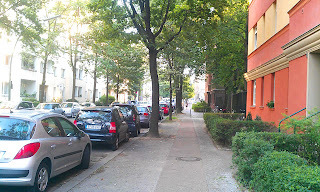 But this is a loud, ugly street, so let's run a parallel side street on the left: nice and green and quiet. Right after the town hall, turn diagonally left onto Salzburger Straße. 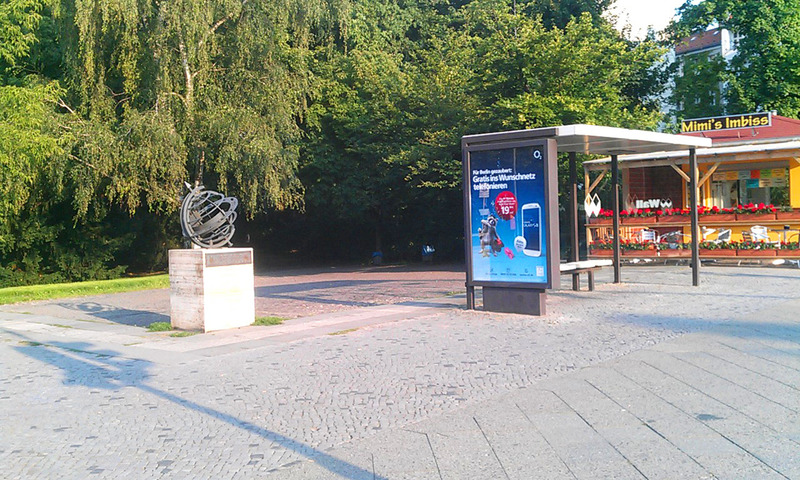 After two blocks, it ends at Bayerischer Platz. Cross that square towards the left and continue northwards on Landshuter Straße. When you cross Hohenstaufen Straße, the street name changes to Ansbacher Straße. Just follow this section the last four blocks to the starting spot at Wittenbergplatz.